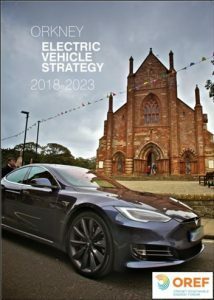 This document, produced by EV driving OREF members, aims to guide the necessary investments for EVs in Orkney. It was consulted upon late 2017 and planned to be revised in 2020. The slides used at the launch are in the Resources>Presentations section. The Strategy urges the urgent introduction of charging (money) for public charging (KWh) to keep the pressure off public charging infrastructure. It urges the installation of charger hubs comprising RAPID (50kW+) chargers in Stromness and Kirkwall, and the widespread adoption of chargers at homes, businesses and accommodation. It specifically warns against putting in too many middle powered chargers (so-called FAST) as they are either too fast or too slow. Excitingly the Strategy also foresees big opportunities for synchronised charging at key locations such as the airport, businesses and some ferry terminals; the latter opening the way to more efficient use of the inter-island ferries and island oriented ‘car clubs’. Finally, it stresses the need to ensure the data systems needed to support such infrastructure are in place.